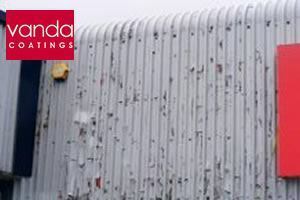 The original coating on Poundstretcher in Swansea was suffering from peeling and flaking cladding and this problem needed to be solved so as not to put customers off shopping there. It had deteriorated to a terrible extent as can be seen from the bottom right photo. What can be done to refurbish peeling and flaking cladding? Many business property owners might think that an exterior in such an atrocious condition could not be salvaged, but they would be amazed at what can be achieved. So that our Vanda team had a clear area to work in, they moved the stock out of the way from the business premises next door. This was a charity shop with furniture outside and it would have been disastrous for the shop owner if the stock was soiled in any way. The next thing our Vanda team did was to jet wash the elevations in order to remove as much of the loose, flaking old paint as possible. They had to use water from a standpipe in the street because using Poundstretcher’s water supply wouldn’t have worked. Our team would have needed about 200m of hose and the water pressure would have been far too low. We now have a jet washer with a bowser to make things easier. This is a jet washing unit with its own water supply contained within the machine. Our operatives always mask off any surfaces that they don’t want coated and in this case the huge Poundstretcher sign and all the glass were covered up. Then the whole of the side of the building had to be sealed in weatherproof primer in order to protect it from the elements before a top coat was spray-painted on. Normally, this noxide would be sprayed on, but because the cladding was in such a bad state, the primer needed to be applied in an extremely thick layer, so it had to be hand painted. Our team leader said it was like icing a cake! Before the top coat was spray-applied to the metal cladding, a large tent was constructed around the Poundstretcher entrance in order to keep any overspray off the stock. Vanda Coatings often work in live retail environments and are used to protecting areas from stray paint whilst a retailer is still trading. 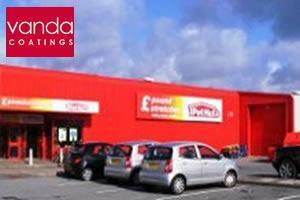 Originally, the Poundstretcher in Swansea was suffering from peeling and flaking cladding, but the results of the renovation can be seen in the top right photo. The final coating was the fantastically vibrant, Poundstretcher red covering about 200 metres squared of cladding, the roller shutter and the exterior as well as the interior of the shop front itself.